When it comes to your brand’s Facebook page, engaging content is king. Without engaging content, your fans will more than likely hit the “unlike” button, especially if they are not your customers. 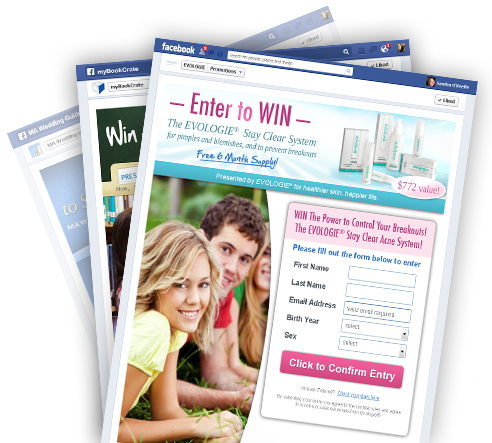 Contests and sweepstakes are a great way to drum up excitement for your fans and get them glued to your Facebook page. However, what really drives those fans to entering your contest is the prize. Contest prizes should hook your fans right away. Whether its in descriptive text or a compelling graphic that shows the prize, your fans should understand what your prize is and why they should enter. When thinking of your prize, you have to think about your target market and your product. These are key in getting the most return on your contest, whether that be converting non-fans to fans or fans to customers. Here’s three different contest prize types you should be giving. For some, it may be best to giveaway their own product as they may not have the budget for a larger prize. This option may also be best for start ups that are looking to increase their customer reach. Giving your fans the opportunity to try out your product may be enough to persuade them to buy your product at a later date. The advantage of offering this prize is that it’ll weed out contest/ sweepstake sharks who go on contest forums and enter contests that give away huge prizes. 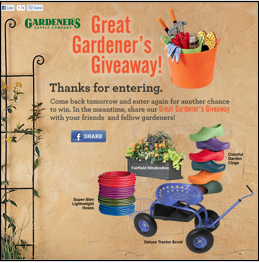 This method works especially well for companies selling niche products, such as the Gardeners contest on the left. Because Gardeners sell products that are solely specific to gardening, giving away such products would attract more of the people who love to garden, thus engaging their core target market. Furthermore, the more people from this segment enter your contest, the more likely they convert from fan to customer in the long term. A prize that resonates with your customer reaches at their likes and interests, outside of your product. It is related to what you sell and should definitely grab the attention of the appropriate target market. A prize of this type does not necessarily have to be for companies on a small budget. 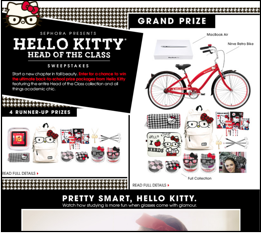 The Hello Kitty memorabilia example on the left makes sense for Sephora for two reasons: one, they sell Hello Kitty cosmetics; two, they know that target customers of Hello Kitty cosmetics are young girls/adults who attend school. Because of the many options of prizes you can give away in this product category, its very important for marketing managers to know their customer very well and giveaway products that they will love. As with the previous example, the more people from your segment that enter your contest, the more likely they convert from fan to customer in the long term. High value prizes are tricky. One the one hand, contest’s giving away these prize types may generate the most entrees because the scope of people who want to win is more broad than with other prize types. 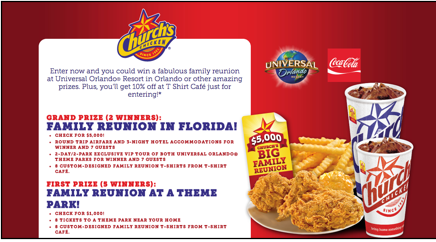 You don’t necessarily have to like Church’s Chicken, for example, to want to win a family reunion in Florida. Offering a prize like this isn’t completely unreasonable for Church’s, since its a chain restaurant that primarily attracts families. Because contests that offer these prize types face the risk of more opportunists to enter, its best for a company to know their main goal for such a contest. If it’s to get as much fans/email addresses as possible, then this strategy should work very well. Choose a prize that excites your customer and meets those goals. We hope we answered all your Facebook contest prize questions. Let us know your thoughts on our post and how we differentiated prize types. We’d love to hear from you. This entry was posted in Uncategorized on August 15, 2013 by socialcontests.